Carpooling helps reduce traffic and pollution and saves parents time, but scheduling rides can be difficult. This app makes it easy and safe for parents to organise carpools and offer rides to school or extracurricular activities. Parents can request and approve rides for their children, which are automatically scheduled and Google-mapped. It is safe for schools and community groups because use is restricted to administrator-approved groups. It encourages drivers to offer rides by measuring kilometres of travel saved and also the community impact on local traffic. The app is free to use and supported by in-app community advertisements. Every day, parents are rushing to bring their kids to school, creating local traffic and pollution. Carpooling helps reduce the number of cars on the road, but scheduling can be difficult for parents. A phone app would make it easy and safe for parents to organise carpools and offer rides to school or extracurricular activities. Parents could request and approve rides for their children, which are automatically scheduled and Google- mapped. Most existing apps are designed for adults who are happy to travel with strangers, like Uber, whereas parents are concerned about the safety and privacy of who is driving their children. My idea is to create and market an app that is safe for schools and community groups. This will be done by restricting the use to administrator-approved small groups, such as school year groups or sporting teams. Using the app would save parents driving time and help kids access activities. Families would also meet and create new friendships. My app would include a point system measuring kilometres travelled, encouraging drivers to offer rides whilst measuring kilometres of travel saved, helping us quantify the community impact on local traffic and pollution. Other unique features include a route- mapping function, reminders and messaging system. I also plan on collecting feedback regularly so that I can improve the app for future versions. The app would be marketed to schools and community groups. I have chosen the logo of a parent pulling a toy wagon to reflect the focus on community building and used the natural colours and the sky background to emphasise the focus on improving air pollution. I plan to test the app at my school for a 12-month period before allowing other local groups to trial it. To encourage community uptake and easy of download, I will request to place the app on the school’s Facebook and Twitter page with a direct link to the app. An in-built survey will collect feedback annually and we can measure the collective distance saved by a community. Once the app is available online, I would approach other local schools and extra- curricular activity groups and encourage administrators to recommend the app. 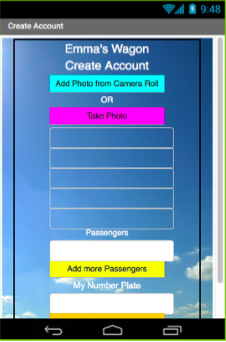 Parents will naturally refer other parents in existing groups to share rides. I have considered several ways to fund the app including fees for parents requesting rides, community advertisements and charging schools a set up fee. To encourage users to try the first version, I plan to make the app free to use for 12 months. Parents can pay $2 to request a ride or $5 to place a community- based advertisement. After the trial period, I will consider the alternative of charging the school or community group a set up fee of $100 as well as applying to other sources eg. company sponsorship or venture capital for additional funding. Once the initial set up fee is covered, additional profits will be reinvested in improving future versions of the app. Although I would like the app to be financially profitable, the main aim of the app is to provide a way of reducing local traffic and help improve the environment. By measuring the kilometres saved by carpooling, we will be able to quantify the reduction in gaseous emissions in the local community. In addition, I hope to build friendships between families who live near by, helping to create a community where parents can help each other. I would like all children to be able to attend before and after school activities, whether or not their parents have to work or drive other children. My greatest concern is that I have not been able to construct all my proposed features using the coding software, App Inventor. Therefore, I plan to trial my first version at my school and use the parental feedback and money raised to construct an updated prototype.